Don’t build silos. Own your data. Re-decentralise the Web. It's hard for frontend developers to build applications that respect user privacy, work offline, store data remotely, and synchronise across devices. Existing solutions either rely on big corporations that crave user data, or require a non-trivial amount of time and expertise to setup a new server for every new project. The backend can often be universal, generic and reusable. We envision mutualisation of services and self-hosting: the backend is deployed, secured and scaled only once for several applications. Don’t lose time with server stuff, reuse the same backend you already use elsewhere. 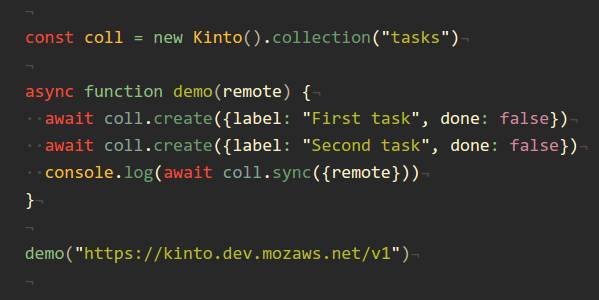 Simply host your app on a static webserver and consume the Kinto API from there. Data can be stored locally and published later when back online. With real time updates and fine-grained permissions. Retrieve remote changes, identify and solve conflicts across different devices. Manage remote content or configuration for your apps via an administration UI. Easily collect structured data from surveys, forms, analytics. At a location users can control, ensuring better privacy and security. Kinto works out the box, providing most of what any application needs to store and consume data. If something is missing, an extensible architecture and many existing plugins probably provide what you need. A full featured Web Admin makes managing your data a breeze. Kinto.js brings an offline-first Kinto experience to the browser.